A warm, gentle book for young children who sometimes struggle to express what they're feeling. A Book of Feelings stars a brother and sister, Sam and Kate, and their dog, Fuzzy Bean. Sam and Kate know what makes them happy: cuddling Mum, reading a story with Dad, swimming, running and dancing ... lots of things! But they don't feel happy all the time, and in the course of the book we see them feeling grumpy, embarrassed, shy, nervous, frightened, sad and jealous. 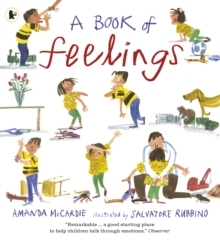 This book shows the children in many different situations at home and at school, and show how they change over time, how emotions can escalate and how people can help each other. 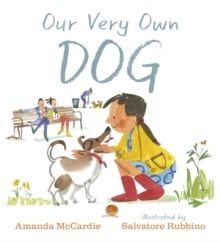 Amanda McCardie's supremely subtle and sensitive text is as alive to the nuances of children's behaviour as Salvatore Rubbino's amazing pictures.